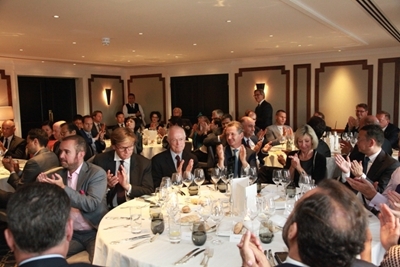 It gives me great pleasure to join you for this dinner co-hosted by Pi Capital and Hampton Group. The invitation to tonight's event came to me five month ago. 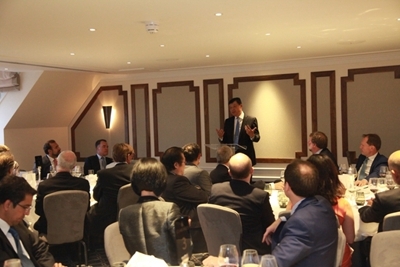 It was for me to talk about the significance of opportunities arising from the "Golden Era" of China-UK relations. But, the events have unfolded in the UK over the past three weeks. I feel sure you will agree with me on talking from a different perspective – the Brexit. The result of the Brexit in the UK may prove to have a profound impact and global significance. · Some people call Brexit an "earthquake". It is sending a shock wave across the UK, Europe and the world. Indeed, almost daily, the aftershocks are still being felt. · Some consider it a "black swan event". It has caught the markets by surprise and given rise to short-term, drastic convulsions. · Some also equate it to a "revolution" driven by an outbreak of anti-elite and anti-establishment sentiment. · They suggest it is a "triumph" of the people over the system. That reminds me of a quote from Vladimir Ilyich Lenin. · It felt like watching the famous TV series 'House of Cards', 'Yes, Minister' and 'Yes, Prime Minister'. · We already see signs of "buyer's remorse". I wonder if there is going to be a clamour for "neverendum". · How will British politics evolve? · What will be the future of Britain-Europe relations? · What impact will the Referendum outcome have on the EU? · How will it reshape the architecture of global relations? Many people are asking these and many other questions. I also listen very carefully to others who answer these questions. The clear consensus amongst the answers I have heard so far is – "huge uncertainties". But since the referendum, I have been busy spreading "certainties". That is, China will remain committed to the "Golden Era" of China-UK relations. · China respects the choice of the British people. · We would like to see a stable and prosperous EU and a stable and prosperous Britain. · China will stay committed to growing stronger ties with the UK and the EU. · China hopes that the UK and the EU will consult and negotiate and reach an early, win-win arrangement on a reciprocal basis. Whether the UK is in the EU or not, China will take a strategic and long-term perspective when it comes to our bilateral relations. And China will continue to deepen and expand our win-win cooperation across the board in the spirit of openness and inclusiveness. · There will be changes within British politics. But we hope the UK government will continue to work with China. · We wish that the UK stay committed to its active, open and pragmatic China policy. · And we also hope that, regardless of any foreign policy adjustments in the UK, advancing ties with China will always be a priority in Britain's external relations. Let me turn from politics to business. So far, business cooperation between our two countries has not been affected. On 25th June, just two days after the Referendum, a Chinese company made a new move. Tianjin Airlines, a subsidiary of China's Hainan Airlines Group, opened a direct flight route connecting Tianjin, Chongqing and London. On 28th June, five days after the referendum, Huawei UK went ahead with its 1.3 billion-pound investment as planned. · Britain is the world's fifth largest economy. · Britain has a large and open market. · Britain boasts world-class services. · And, Britain is a global leader in many other business sectors. First, we need to expand investment and trade. · We hope that Chinese investment will remain welcome in the UK. · We need to advance the agreed cooperation projects, such as Hinckley Point. · And, we can also discuss a higher-standard arrangement for bilateral trade and investment. Second, we need to enhance our financial cooperation. · We value London's position as a global financial centre. 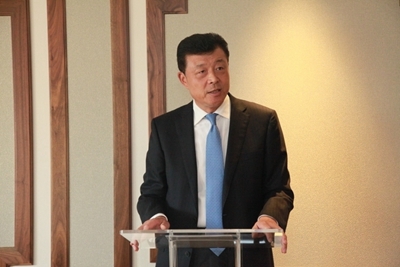 · We will continue to support the building of the offshore RMB market in London. · We will carry out more green financial cooperation between our two countries. 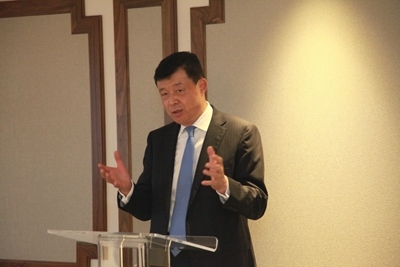 · We will encourage more Chinese banks to come to Britain. · And, we also hope that the UK will reach with the EU a mutually beneficial financial service arrangement. Third, we need to dovetail our respective development strategies. · Both Chinese and British business communities should get deeply involved in our respective development strategies and plans. This includes China's One Belt One Road Initiative, the Yangtze River Economic Belt, Made in China 2025, and Britain's National Infrastructure Plan and the Northern Power House. · We hope that we can leverage our respective strengths in technology, innovation and financing. · We looks to more cooperation on infrastructure building, acquisition, financing, as well as international capacity cooperation. Fourth, we need to work together for global growth and prosperity. · China and the UK need to jointly advance the reform of world economic and financial governance. · China and the UK need to facilitate the building of a multilateral trade system. · China and the UK must stand against protectionism. · And, China looks forward to working with the UK at the G20 Summit in Hangzhou, China. We should join hands to produce fruitful results. · China will work with all countries to build up confidence and stand against challenges. · China will join forces with the rest of world to restore stability and to seek a solution to the root cause of existing problems. · And, at the same time, China will pursue steady economic growth at home. Steady growth in China is itself a contribution to global prosperity and stability. · In the first quarter, China's economy grew by 6.7%. · And, the second quarter witnessed this steady trend of growth continued. · Business profits was picking up steadily. · The service sector is developing rapidly. · CPI was kept stable and decline of producer prices slowed. · And, the employment market was stable. · China's economy is still in transition. · The foundation of steady growth are not solid enough. · And there is still downward pressure and likely short-term fluctuations. · China will continue to innovate ways of macro economic management. · China will implement its proactive fiscal policy with greater intensity and efficiency. · China will carry out a prudent monetary policy in a flexible and appropriate way. · And, China will channel more resources into the new economy which facilitates transition and upgrading. Second, China will continue to implement the five key development concepts, namely, innovation, coordinated development, green economy, opening-up and inclusiveness. · China will expand overall demand appropriately. · At the same time China will advance supply side reform steadfastly. · China will cut overcapacity, reduce excessive inventory, de-leverage, slash business costs, and shore up the weak links. · And, this will enable China to maintain a medium-to-high growth rate and move to a higher development level. · China will follow through the innovation-driven development strategy. · China will grow a new economy, create new growth engines and encourage innovation and entrepreneurship. · China will develop a sharing and start-ups friendly economy. · And, China will create new growth points – such as with digital developments. · China will streamline administration and delegate more central power to lower authorities. · China will strive to eliminate overcapacity. · China will advance reforms in a coordinated way. This will happen in key areas such as fiscal and taxation, the financial sector, state-run enterprises and market access. · And, China will work to unleash the vitality of our economy. · China will make its economy more open. · This means greater access to the service sector and general manufacturing sector. · We will create a level playing field that is more transparent and predictable to investors. · The fundamentals of China's economy remain positive in the long run. · The Chinese economy still has much resilience and huge potential and there is ample space for further growth. · The foundations and conditions for growth remain positive. · Structural adjustment and improvement continues to advance. A recent KPMG survey of over 1,200 chief executives worldwide, shows most company bosses still consider China the most promising growth market. These top business leaders are confident about China's future. "Thousands of boats sail past the sunken ship by the shore, and millions of saplings spring forth from the dying tree." Hard times will not stop the wheel of history. Challenges always come with opportunities. This is why – despite the current uncertainties – I call on you to have confidence in a promising future. Also, I call on you to seize the opportunities and stand up to the challenges. Working together, we can navigate the uncharted water and ride through the waves. Together, we can create a brighter and better future of China-UK business cooperation.